Hi again Aleheads – it’s been a while since I’ve had a chance to post: it has been a busy fall and winter for the Professor. I’ve been buried in a job search that has been dragging on for many months and culminated in a huge amount of travel all over the country – including a visit to Brother Barley last fall. In between the holidays and a lot of other ups and downs, my brother got married. I love [drinking beer at] weddings as much as the next guy, and being the best man at my brother’s wedding was fantastic. Of course, my brother knows me well, and he gave me the best groomsman gift an Alehead could ever ask for: a 6 month subscription to a rare beer of the month club. And so it has come to pass that at the end of each month I run to my mailbox like little Ralphie in “A Christmas Story” waiting to see if my box of two 750 mL bottles of rare beer have arrived. The beer of the month club is perhaps the greatest of the “of the month” clubs: slightly classier than the sock of the month club, more fun than the toothbrush of the month club, and certainly better than that terrible jelly of the month club that you get when your company is too cheap to give out christmas bonuses. But I digress. This particular club is run by the creatively named company Monthly Clubs, and they have a few other offerings besides the rare beer – microbrewed beer, wine, cheese, chocolate, cigar, etc. You have the option of getting 2, 4, 6, or 12 bottles at a time. With each monthly delivery comes an info sheet describing each beer, including info about the beer itself (style, ABV, suggested serving temperature, suggested glassware) and trivia about the particular brewery. Since most of these breweries are in Belgium, France, or Germany, they tend to be small operations and it’s great to get a little history about the beer your’e drinking. It also goes without saying that the beers from these small breweries are often pretty tough to find in the US – especially when you live in an area without any great bottle shops like me. The guys who write these sheets are clearly Aleheads at heart – true beer lovers with a flair for writing (and like most other Aleheads, likely good looking, successful, well endowed, and very, very drunk). Some of their notes are online, and i’ll link to them where possible — they’re interesting reads. It’s not a cheap way to get your beer, but i’ve certainly had a selection of unusual brews that I wouldn’t have been able to find myself. I can heartily recommend this “of the month” club for any Alehead. I’m not silver tongued like some of the other Aleheads, so I tend not to write tasting notes, but i’ll add a little about what I thought about each beer. 1. Klein Duimpje Huisbrouwerij (Tom Thumb Homebrewery) Kerstbier. This is an offering from Hillegom, Netherlands. “A Belgian strong dark ale meets holiday strong ale” is how this one was described, and it lived up to the billing. A truly handcrafted beer, this one was a treat. We drank it over Christmas and it went great with gingerbread to finish off the night. Character like a Belgian strong ale (bold fruity aromas), but darker with a more earthy finish. It has been aged already for 2 years, so the malty overtones have been allowed to mellow. The result is a very good beer – 3.5 hops. 2. Brasserie Pietra Pietra de Noel. Brasserie Pietra is located in Furiani, France. Although they’re a newer brewery, this brew keeps with the European tradition of offering a fortified beer once a year. Brewed with chestnut flour, this holiday amber farmhouse ale was pretty interesting. It was quite malty, but I wasn’t able to pick up a chestnut smell or flavor: just a standard (albeit rich) malt profile – however the beer itself appeared to have a chestnut color. Clearly well made, and I enjoyed it but found it rather uninspiring overall. 3 hops. 2. Brasserie la Choulette La Choulette de Noel. Another French beer, this time from Hordain, France (Central Northern tip of France). This is a Biere de Garde, a darker French farmhouse ale that was nearly lost to time – and according to the New York Times (for what it’s worth), this is the ultimate example of the style. I really enjoyed drinking this one, it poured quite dark brown and had a toasty flavor with a subtle acidic/tart flavor. Definitely go for this one if you can get your hands on it. 3.5 hops. 1. Grand Teton Brewing Company 2009 Cellar Reserve Sheep Eater Scotch Ale. This is a Scotch Ale/Wee Heavy brewed in Victor, Idaho – the only domestic I’ve seen so far. This was a fantastic beer, and for those calling for an Imperial Scotch Ale, I think this is about as close as you can get (it’s certainly the closest I’ve ever had). A rich reddish brown brew with a thick foamy head, the Sheep Eater comes off as especially dry despite it’s apparent sweetness. Easy to drink, refreshing, fantastic. I can’t think of a bad thing to say about this one. 4 hops. 2. Brewerij Kerkom Bink Grand Cru. Another Belgian beer, this one from Sint-Truiden, East Flanders (Northeast Belgium). This is a Belgian Extra Strong Dark Ale and packs a 13.0% ABV wallop. Probably more appropriately served in a 12 oz bottle than a 750 mL. I actually thought this beer was delicious, but the alcohol just overpowered the rich roasted malt. It pours almost black, and has a thick brownish head with large lacing. I would like to have enjoyed it more, but I couldn’t get over the smell of the alcohol. It pains me, because this is typically the kind of beer I love (sans the 13% ABV) but this one only gets 2.5 hops. I got up after drinking this one and tripped over my shadow. Mrs. Lager wanted to know if I was feeling sick. Nope, just drunk. Delicious! These great beers won’t stop me from homebrewing, but they certainly challenge me to make better beer. I’ll post more updates as my new brews come in. Posted in Beer Culture, WTF.Tagged Beer of the month. The Noir de Dottignies was very, very good. An easy 3.5 hops. I’m not typically fond of BSDAs, but this one was really well crafted. We were honored that you would share! 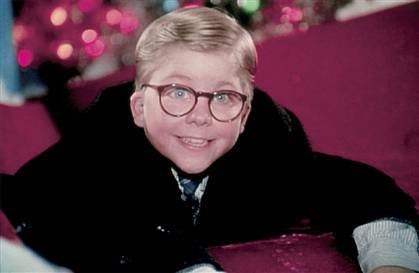 I think your photo should have been Ralphie opening his mailbox excitedly, looking for his decoder pin. When you think about it, this one seems to suggest that Beer of the Month Day is followed by a Santa boot to the face, given the context of the movie. …is your Beer of the Month Day typically followed by a boot to the face? Excuses me! You have no time to post while not working in underwear playing the tony hawk skater?? For me, I thinks you were in prison. Does anyone else on the site speak Crazy Russian? I need a translator. He’s not even Russian. He’s Lithuanian at best. And he speaks perfect English. He just fakes the accent and wears tracksuits so he can pick up unsuspecting women in bars in the Meatpacking District. He does make a mean borscht though.